A couple of years ago when I was just painting ACW and Germans and Americans for WWII I could make do with maybe three to four dozen paints. Those were stored in a toolbox and that was it. Then I started to expand into other periods it quickly outgrew the toolbox and I switched to one of those FIRA boxes from IKEA, but even that did not last too long until it was full last year and I still had paints not stored away. Unfortunately IKEA had ceased selling FIRA and those one could see on eBay would go for ridiculous prices. A friend of mine was able to help me out with FIRA´s big brother MOPPE, but since they were different sizes storage was a problem and there was lots of wasted space in there. So during this winter I decided to build a case of my own and got myself the necessary materials earlier this month. 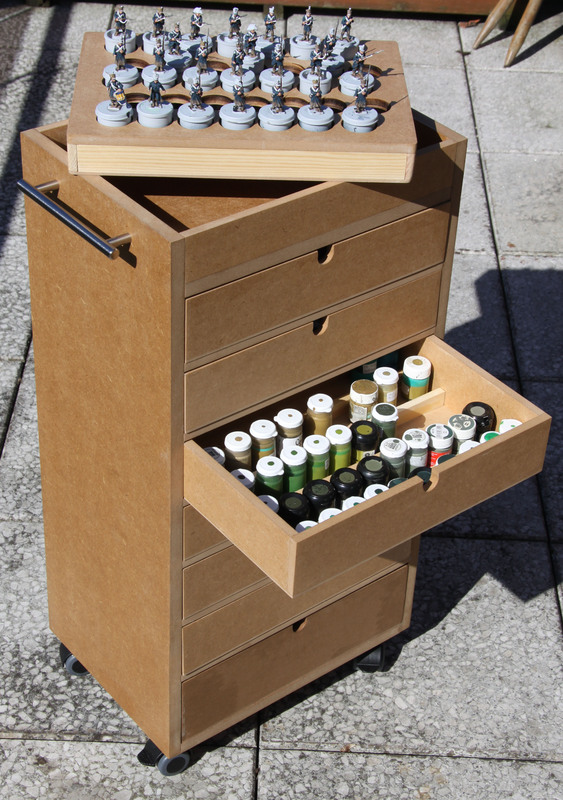 Now what I have is a very sturdy cart that comes with wheels so I can easily drive it into the storage room if we get visitors and two large handles, so it can be lifted onto the balcony for outdoor painting in the summer. 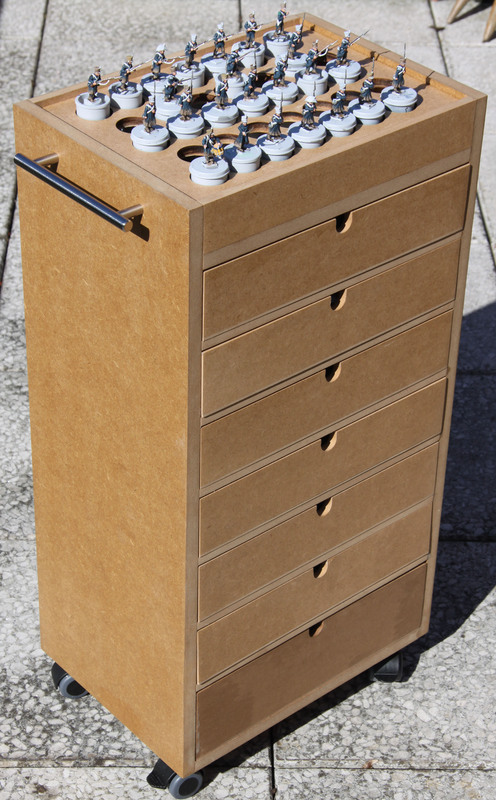 It has six drawers, each with room for 50 paints. One of those is still empty and most still have space for between 6 to eight paints, so I can still expand my collection. The bottom drawer is a bit higher than the others and is meant to store stuff like my sculpting tools, brushes, water glasses, glues and the like when not in use. The top has a open-topped area you can put stuff like books onto. Now I also made a tray for my unpainted minis that fits into the top area. it has cutouts for up to 38 minis mounted on film containers. The cart itself is about as high as the average tabletop, so one can easily reach the minis on top and the paints in the drawers (the bottom most is just the hight your hands will be when you lt them dangle) when sitting down. It has seen its completion and first use this weekend and I am mighty happy with my work! The bottom drawer is still a bit darker than the rest, since I varnished it only today (long story) and the varnish has not dried 100% yet. As you can see from the pictures, the Marine Artillery is making good progress, so I am positive that I will have the final battalion finished in time for the La Bricole Painting Competition deadline. Since I can see the questions coming, let my allow a few words on other things here. Why do I mount my minis on empty film containers while painting them? Why are there no dropper bottles? I do not like them, since I always put more on a pallet then I need and you can not really get it back in. On the other hand I like to paint from the lid. I always have a dropper bottle of distilled water at hand to delude them and close a bottle at least every 20 to 30 minutes to shake them and maybe add a drop of water or two. Never had any problems with paint drying out, getting flaky or any of the other problems people report. My paints are a mix of Vallejo, homemixed (from artist acrylics), Andrea, Coat d´ Arms, GW, Foundry and P3. If anything comes in a dropper bottle I just fill it into a Foundry / CdA / P3 style bottle that I bought with an artists supplier. Strangely enough these do not have the problem with the tap (the one you use to pry the bottles open) ripping of like the Foundry and P3 bottles do. Now that is nice but very neat, not too worrying yet…. A great piece of kit!!! I agree this is one nice piece of kit, nice small foot print too so it wont take up much space. Good show. That is a great bit of custom engineering. You should go into business and sell them on e-bay! There have been a couple of people saying, that I should sell them. So I am actually contemplating selling custom build ones over this blog.